I debated whether I should ride yesterday morning. I haven’t been sleeping well lately and it’s hard to get up early in the morning and go for a ride– especially a long ride. Because of some personal issues my motivation is way down and I’m not as enthused about riding my bike. I left the house later than usual when I am doing a century plus route. It was past 8am. I was just cruising along on the Coast Hwy, southbound, when two riders came up alongside me at a light. We rode hard from Jamboree to Laguna Beach –trading pulls and working the rollers. It felt good to be pushed. In Laguna Beach they invited me to join them and their group. It appears they were meeting at Top of the World and doing the steep hills of Laguna Beach. I declined because I was running a standard chain-ring set-up of 53/39 and an 11/23 cassette. If you are not familiar with the hills in Laguna Beach they are very steep. Many are over 12-15% and go on for about a mile sometimes more. I ended up doing the hills anyway– alone. As I said before, I wasn’t motivated so going on a century was not appealing. 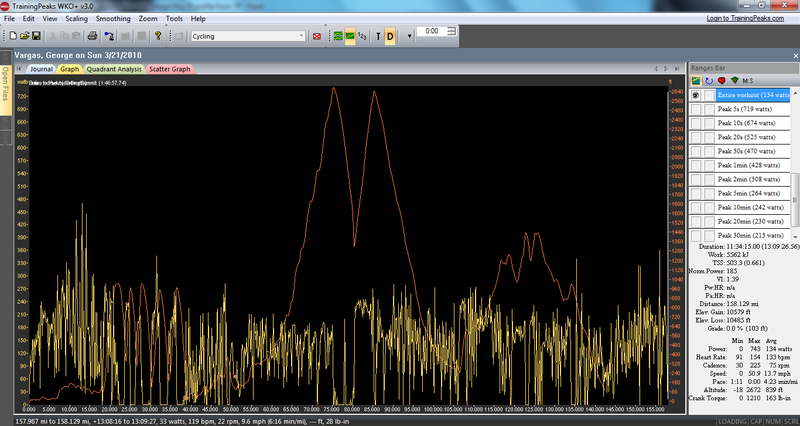 I figured I’d do a couple of hills get some elevation gain– quickly and then go home. I also thought that the steep hills would get me physically and mentally prepared for the last climb in the Mount Laguna Bicycle Classic on April 17 blog post here. 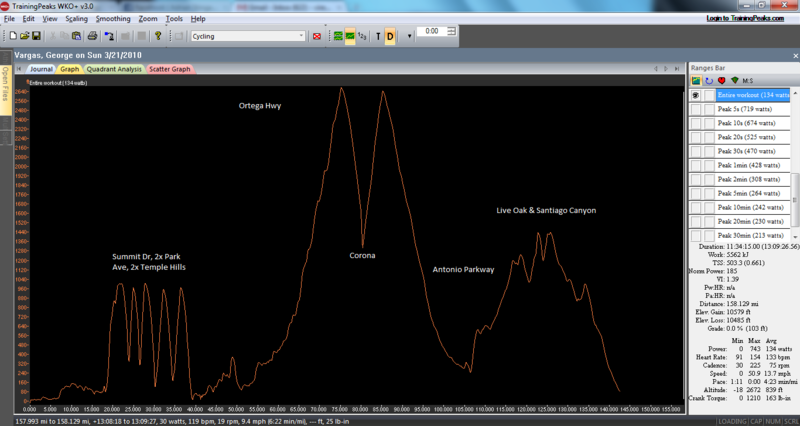 Pine Creek Road has extended sections over 12% and peaks out somewhere in the range of 18% grade. I began my hill repeats by going up Cress which connects to Summit Dr. Then I descended Park Ave and climbed that twice. It’s funny to see the pick-up trucks shuttling the downhill mountain bike guys/gals up so they can descend. I kept seeing the same trucks with bikes on the way up and then no bikes on the way down. Isn’t climbing half the fun? I then found another hill not as steep called Temple Hills which you can begin climbing from PCH at Thalia. I climbed that hill twice as well. I did the climbs mostly seated just working on my pedaling technique and working on leg strength. Let me tell you a 39/23 is NOT the friendliest gear to climb Park. 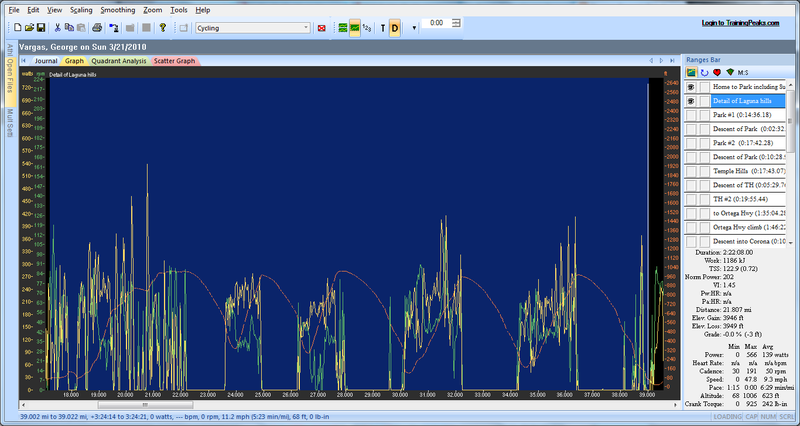 Ideally, you shouldn’t attempt these hills with anything less than a 12-27 cassette. I would go one step further and suggest a compact crank. Temple Hills is more manageable. It’s still tough but the key was slow, methodical pedaling to work on proper technique. After doing those five hills my legs were shot and I was hungry. I didn’t eat breakfast before I left the house. So I stopped for lunch and sat at Main Beach in Laguna. I watched people playing volleyball and wondered if they come here every Sunday like I ride my bike every Sunday? Is this their sport, their passion? I watched families walking leisurely with their dogs and watched couples walking while holding hands. It was romantic and relaxing but at the same time I had to squash my feelings before they took me over. I then realized it was a Sunday– and it was my first day off in 7 days and I should stop feeling sorry for myself and do something with the day. So I decided I would go to Lake Elsinore. I should point something out. It was way too late in the day to take on this type of “Adventure”. It would involve at least 4 hours, 52 miles 4,000 feet of climbing just to go Lake Elsinore and back — that’s not counting getting to the foot of the climb and then getting back to Huntington Beach after descending back into Orange County. It was well after 1:30 pm. Leaving Baker, you climb a gradual but relentless 2500 feet in 20 miles (2.3 %) (Mountain Section Eight). It may be heating up, so drink plenty. A long descent leads to Kelso at mile 418. The climb from Lake Elsinore on Ortega Hwy is a nice climb. You can actually see the elevation you have gain because the road has many turns that double back on themselves and you can look down. 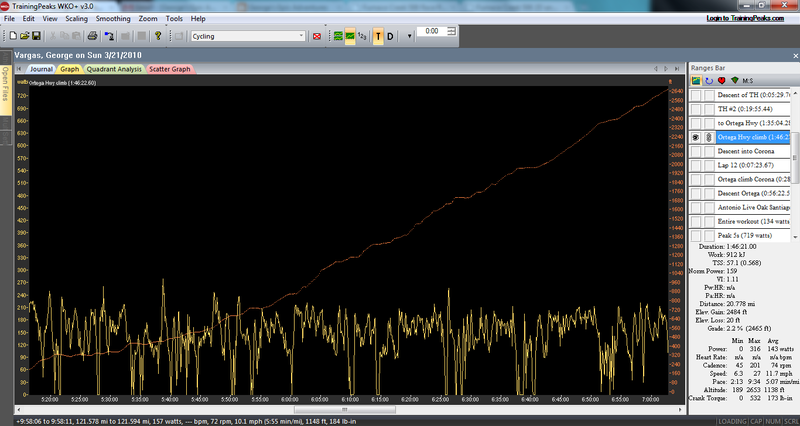 The climb is 4.8 miles and gains 1300 feet with an average grade of 5.3% –with dips. Up and over Ortega Hwy and then up Antonio Pkwy continuing on to Live Oak and Santiago Canyon. It was getting dark and I was racing the sunset. I didn’t make it. It was 845 by the time I got to a restaurant to eat and past 9pm before I got home. My not so motivated start and short ride turned into 160 mile ride 13 plus hours on the bike. My legs were wrecked. I was famished and really cold. I was under dressed and cold and I was calorie deprived. I didn’t take any nutrition stuff with me since it was only supposed to be a 2 hour ride. The calorie deprivation made me feel colder than I normally would. The last 2 hours of my ride were in the dark with no lights, no reflective gear and dark clothing. I know not very smart eh? But it’s done now and I am stronger physically and mentally for it. 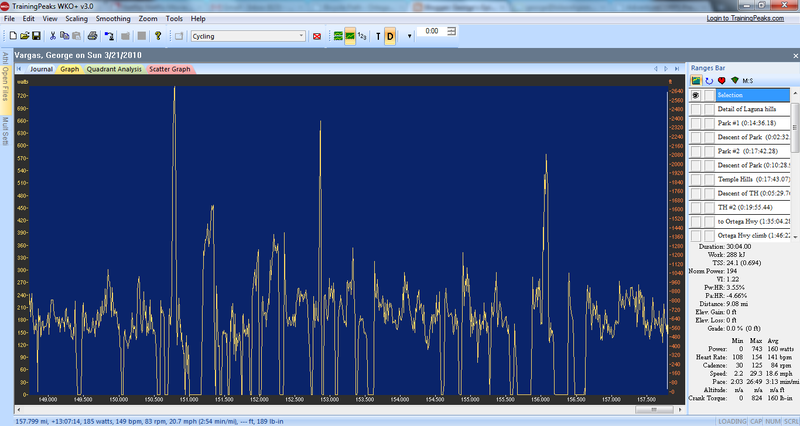 Just for kicks on the last 9 miles of my 160 miler I was putting surges over 600 watts topping out at 743 watts which incidentally was the highest for the day but came at mile 150. George! You are nuts. I love reading about this stuff.There is no way in hell I would ever attempt a 160 mile ride with zero calories with me. I load my pockets full just for a century ride. Am I crazy weak, or are you crazy strong. Perhaps a bit of both. This sounds like a fun adventure, wish I could have ridden it with you. I am riding the Hell's Gate Hundred next weekend, so I will be encountering one of those never ending climbs just like the one you described here. Take care buddy! Marcus,Thank you for reading my blog and taking the time to post a comment. Let's just say it was poor planning on my part. I wasn't motivated to ride a 100 miles much less 160 miles. It just worked out that way. I don't like wasting a day off and thought I should take advantage of it. As far as nutrition I am using Infinit Nutrition this year and it's working out great. I just didn't pack any because well…I thought I was only going out for a 2 hour ride. We all need fuel when we ride so crazy strong or crazy weak…how about we are all crazy for doing this ultra stuff ;)I might ride the Hells Gate Hundred. I have to make sure things are covered at work. You'll know if I'm going when I make a blog post.Good luck "out there"! how was traffic on ortega hwy? i've always wanted to climb it but everyone says that its suicidal with all the motor bikes and cars screaming up and down that road, especially on the weekends. Anonymous,I didn't find the traffic to disconcerting. We live in southern California and there are only so many places to ride that are free of traffic. If this is any indication of my fear or concern of the road not being safe, I've been thinking about when I can go back. The reasons why someone would choose to ride out there are as varied as there are riders. But my reasons are so that I can get a good four hours of endurance paced riding (about 50 miles round trip) without traffic controls (stop signs, lights etc.) Additionally, Ortega Hwy is so close to "civilization" but yet you feel removed from it …if only for a few of hours. thanks for the info! i'm definitely going to give it a try sometime. i'm in OC like you are, so i'm always looking for any sustained climbs nearby. tired of driving out to the san gabriels to ride the 39 or santa monicas. and like you obviously have, i can only kill newport coast/ vista ridge/ ridge park so many times before i need a change of scenery!